Offering a comprehensive educational and performance experience for choral music professionals to enhance their skill sets in the area of rehearsal techniques, literature, pedagogy, and technology, the Southwestern American Choral Directors Regional Conference was held March 7-10 in Kansas City, MO. This conference represents countless hours of real time continuing education in the area of choral skills, performance, and literature review. Cowley College vocal music director Marcia Wieland has attended American Choral Directors Conferences since she was a young singer in middle and high school, throughout her collegiate career as a student, and now as a working professional. Wieland was thrilled to have her students have an opportunity to attend the conference. 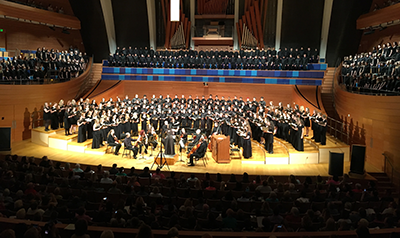 ACDA offers the only choral educational events that include instructor-led hands-on workshops, master classes, and in-depth lectures from the top choral educators and performers from across the country and in many cases, the world. Performance ensembles are selected from the very best choirs by a rigorous audition process resulting in a variety of performance types, multiple examples from the field of choral work as well as innovative concepts for how to further grow and expand the performance literature. Wieland said in addition to the educational sessions and choral master classes and performances, choral reading sessions offer the opportunity to learn new music many areas of teaching and performance including all levels of specialized focus making this event a perfect opportunity for working collegiate professionals as well as aspiring collegiate educators like the students at Cowley. Further, seminar sessions and showcases with industry professionals widened Wieland’s personal horizon and professional network and provided the students with new professional contacts. “Students will retain this experience for years to come and easily be able to share their knowledge with classmates and the department through their improved abilities in rehearsals and lectures,” Wieland said. Cowley College Student ambassadors attending as future music educators were,Emily Lawson, Caleb Bettles, Austin Sherman, Zach Heyer, and Elizabeth Willie. 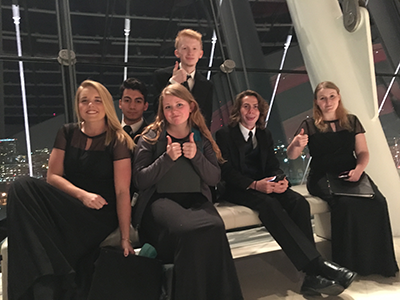 Student ambassadors attending as honor choir participants were, Paige Lundin, Jon Claybaugh, Molly McCune, Clay White, Riley Payé, Michael Rodriguez, Charity Schmidt, and Austin Crowe.